An elegant cocoon of Japanese comfort, The Capitol Hotel Tokyu seems to be a world away from the busy streets of Akasaka surrounding the property. Frequented by Japanese dignitaries and international VIPs, the hotel is known for its privacy, its exclusive location next to the greenery of Imperial Palace and its high level of service. 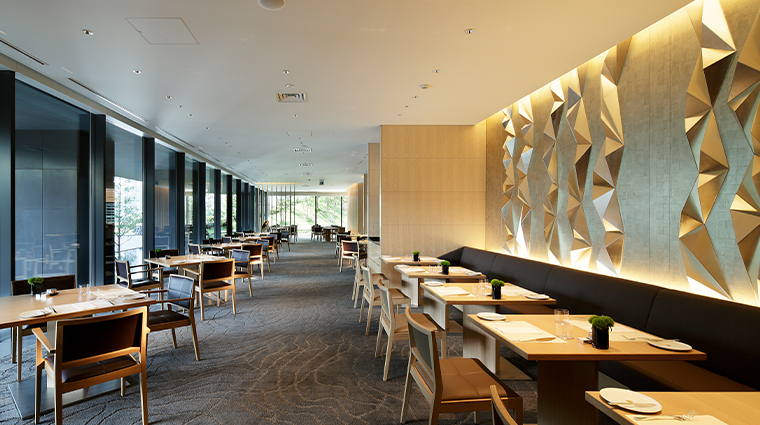 Rebuilt from the ground up and reopened in 2010, The Capitol manages to reflect its long history as one of Tokyo’s premier hotels as well as a thoroughly authentic Japanese aesthetic. The luxury hotel celebrates ikebana, the Japanese aesthetic art of flowers and plants. Breathtaking seasonal ikebana masterpieces adorn the lobby, designed by the world-famous Sogetsu Ikebana School (a la Bellagio in Las Vegas). 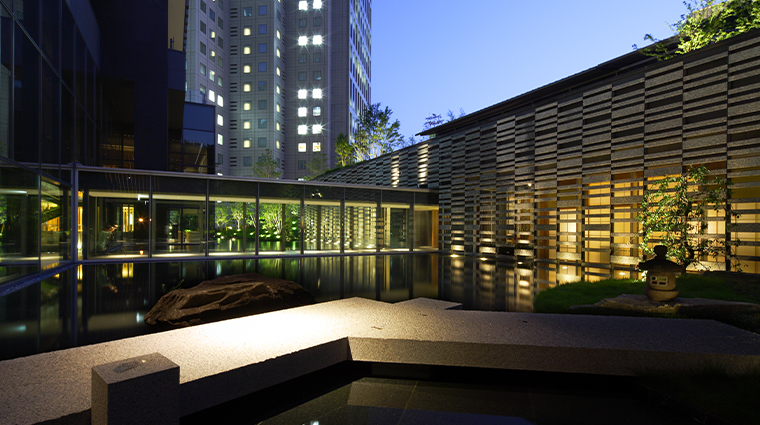 Water is associated with growth and strength in Japanese culture and is an important element of the hotel’s design. The aqueous theme is consistent throughout the building: relaxing fountains, the use of spring water and even the carpet has designs of streams and water ripples. The Capitol Bar has a special corner for Beatles fans — a collection of memorabilia and relics from the band’s only Tokyo sojourn when it stayed at the property (then known as the Tokyo Hilton Hotel). The Capitol Hotel Tokyu occupies one of the best locations in Tokyo. It’s just minutes away from both the business district and the bustling nightlife of Roppongi. Getting around won’t be a problem here. The hotel sits directly above a subway station and is serviced by a constant flow of taxis. All water used around the Tokyo hotel comes from the natural spring of the sacred Hie Jinja Shrine next door. The two-floor fitness center has an indoor pool and a whirlpool that overlooks the Imperial Palace grounds. The hotel’s 251 rooms and suites have distinctively Japanese décor. Expect a modern take with traditional twist — you’ll enter the room via moveable shoji paper screens to find luxurious furnishings low to the ground, elegant Japanese wallpapers, and a distinct minimalistic look. Rooms and suites overlook the most beautiful sites in Tokyo, such as the Imperial Palace, the 500-year old Hie Jinja Shrine and beautiful landscaped Japanese gardens. The bathrooms are a highlight, with large tubs, an opulent rainfall showerhead and stocked with The Capitol’s own choicest bamboo amenities. Suites offer Farmacista Antica products and Japanese bath salts. The six eateries and lounges serve a range of cuisines, including fine Chinese at Star Hill and international delicacies at Origami. The Capitol’s signature restaurant, Suiren is a stunning modern Japanese spot separated from the world by a lovely surrounding water feature. At Suiren, indulge in teppanyaki grilled meats and vegetables, kaiseki (a series of small, carefully crafted Japanese dishes) and superb sushi sourced daily from Tsukiji fish market. End your meal with a nightcap at the Capitol Bar, quite a find for whiskey lovers with a vast selection of Japanese and international varieties.